The use of advanced high-strength steel (AHSS) with ultimate tensile strengths of approximately 145 ksi is fairly common in the automotive industry. Trends indicate growth in applications requiring even higher-strength grades, to 200 ksi and beyond. These ultrahigh-strength materials dramatically affect how we process tooling, select press equipment and view the overall stamping process. AHSS materials often are referred to as automotive materials, and rightfully so, as this is the application for which they were developed and first used. However, it would be unwise for metalformers not involved with automotive components to ignore what is happening in the world of AHSS materials. In the 1970s, high-strength low-alloy (HSLA) steels were considered to be automotive grades. However, these materials now find use in nearly every industry due to their higher strength, good formability and ease of weldability. The same likely will hold true for some AHSS workhorse grades, dual-phase grades in particular. In general, metalformers processing these higher-strength materials must have a higher level of understanding of cutting and forming mechanics, tooling design, die construction and equipment selection. This applies not only to AHSS, but also to HSLA steels, stainless steels, nickel alloys and titanium alloys. 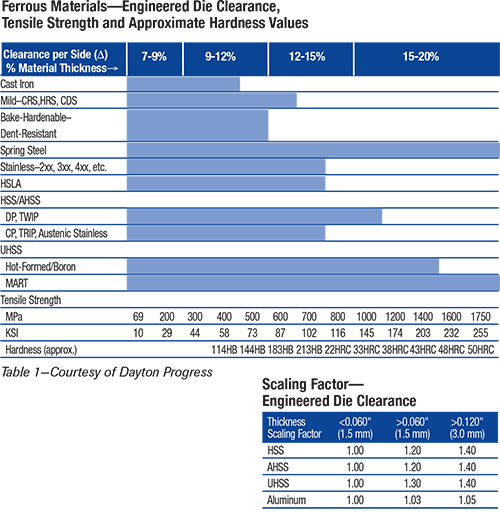 Case in point: The higher stresses required to penetrate higher-strength materials require increased cutting clearances between the punch and die, compared to clearances used for mild steels. Also, as material thickness increases for higher-strength steels, so must cutting clearance (Table 1). Simply applying a 10-percent-per-side cutting clearance—a commonly used rule of thumb—will not suffice. When cutting clearances are too tight, increased galling and chipping can result. The severity of galling depends on the surface finish and composition of the tool steel and the workpiece material. Chipping occurs when process stresses are high enough to cause low-cycle fatigue of the tooling material, an indication that the material is lacking in toughness. When cutting clearances are too large, punch cracking can result. Cracking results spontaneously when the process stresses exceed the tensile strength of the tooling material. Punch cracking is a concern with high-strength-material applications because of the work material’s higher strength. Routine processes such as heattreating become critical and require a greater understanding of both the process and tool-steel failure modes. Tool steel is heattreated in a multi-step process. First, it is heated to a temperature high enough to create a solid solution of iron and carbon in a process called austenizing. Austenizing is followed by quenching to produce a hard, martensitic microstructure. Quenched martensite is strong but very brittle; only after it is tempered does it become tough and slightly more ductile. Unfortunately, for most die shops and manufacturing companies, heattreatment is a “black-box” process: Soft die details are sent out to the local heattreat facility and hardened details are returned. A cursory Rockwell hardness test may be conducted at the die shop when the parts return. If they meet hardness requirements they are usually accepted, regardless of how they may have been processed. This is a problem. Case in point: Die failures can occur due to overheating damage during their heattreatment. Because most die steels are relatively high in carbon and/or alloy content, they are sensitive to damage by overheating during austenizing. Overheating causes grain growth, coarse martensite formation and excessive amounts of retained austenite, all of which results in brittle dies that are susceptible to failure in service—even if the surface hardness is within specification. For stainless steel applications, commercial products such as kitchen utensils and appliances are common. In the automotive sector, it is exhaust systems that usually come to mind, but there are other applications, such as stainless-steel body trim, windshield-wiper arms, cylinder-head gaskets and fuel-filler necks. Stainless steel also has appeared in structural components in some automotive structures as a highstrength solution to lightweighting. Stamping companies and tool shops experienced with plain carbon steels often have problems making parts from stainless steel. Negative past experiences and poorly designed processes often produce poor results that can fuel misconceptions and myths regarding these corrosion-resistant materials. 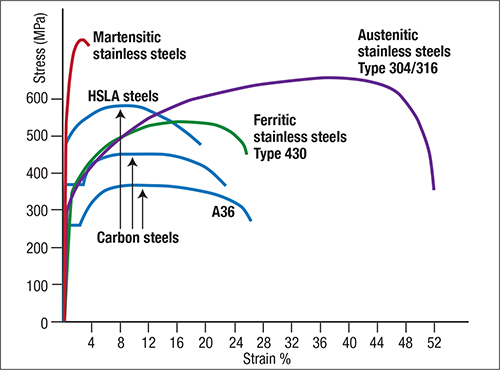 For example, most stainless steels have work-hardening rates that are greater than those for plain carbon steels. A common misconception is that stainless steels are less formable than low-carbon steels because they work-harden too much. In reality, stainless steels are very formable—many grades have substantially higher ductility than plain carbon steels. Stainless steels frequently are deep-drawn into very complex shapes without the need for intermediate annealing. Even the less formable ferritic grades have outstanding ductility (Fig. 1). However, due to their high work-hardening rate, more press power and press energy is required to form stainless steel. Frequently, a 100-percent increase compared to low-carbon steel of the same thickness is required. A unique feature when cold-forming stainless steels is that more severe deformation is possible when slower forming speeds are used. This is different from plain carbon steels that form virtually the same regardless of the forming speed. In general, when forming stainless steel into difficult shapes, you will want to slow down. The required clearances between the draw post (punch) and die-cavity wall will be greater for stainless steels compared to plain carbon steels. Austenitic grades require sheet thickness plus an additional 35 to 40 percent; most ferritic alloys require sheet thickness plus 10 to 15 percent additional clearance.